Most gardeners anxiously await planting season and often get over zealous. Either the garden ends up larger than planned or more tomatoes, potatoes, and zucchini are planted than are actually needed. It is similar to going to the grocery store when you are hungry – you end up with more than you intended. Another situation may arise that the crops over performed, also leaving gardeners with a surplus. Although some of the excess may be shared with neighbors, friends and family, much goes to waste. According to AmpleHarvest.org, the amount of garden produce that goes unused in the United States could feed 28 million people. Make this year one that you intentionally plant extra and/or plan to give your surplus to help feed the hungry in your community. It is estimated that one out of six Americans is food insecure, meaning they don’t have access to enough food or a wide enough variety of food to make up a healthy diet. No matter where you live, there are people in your community that are experiencing hunger. Food pantries throughout the state are helping to meet that need but are often lacking in fresh produce. According to Feeding America, the number one item requested by pantry clients in Iowa that is not available to them is fresh produce. Donations from home gardeners and commercial fruit and vegetable growers are important to food pantries. It is a fairly easy and very worthwhile process. AmpleHarvest.org has an online registry of food pantries throughout the country. Click here and enter your zip code to find a registered pantry near you. Once you find a nearby pantry, click on that link to learn more about them, including their hours of operation, when is the best time to drop off produce, and how to contact them. It is also a good idea to ask how much fresh produce they can accept in one delivery. It may be useful to stop by and talk to them before the harvest season begins to learn more about the type of produce and the type of delivery containers they prefer. They may have a request for a particular type of produce that is preferred by their clients. It is fun to grow an extra row of a particular item that you know people are excited to receive. Make sure the produce that you donate is high-quality enough that you yourself would eat it. It should always be fresh, at a suitable ripeness and relatively clean. 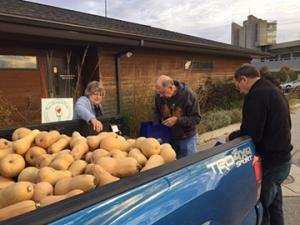 For information about safe on-farm food practices and information to food pantry workers about how to keep donated produce safe, check out Iowa State University Extension and Outreach publication, Pm-1073E Food Pantry Produce Donations - Grower Information, available free to download. This would make a good community project for your family to participate in this summer and you may be able to receive a tax credit. The Iowa Department of Revenue offers the Farm to Food Donation Tax Credit for ready to consume commodities donated to registered food pantries. Learn more at the tax credit’s website. It is a wonderful gift to be able to spend time on a hobby you enjoy and help your community at the same time. This year, consider planting a portion of your garden for donation to your neighbors in need.